At Hypoxico Inc, our systems and technologies are currently utilized in several fields of research. Hypoxico equipment delivers highly controlled low-oxygen or high-oxygen air and can used for a variety of research applications. These hypoxic and hyperoxic systems deliver O2 levels as low as 5% and as high as 30% and come with a variety of control, data-log, and scheduling options. Both our personal-use line of equipment and the K2-Series commercial-grade- system can be utilized for research on human or animal subjects. The K2-Series offers the degree of oxygen control and high-flow rates often required for scientific research offering the most accurate and stable hypoxic air-flow of within .1% accuracy. 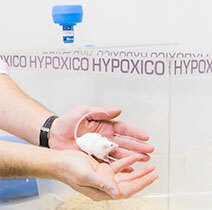 Many college and university research facilities have used Hypoxico systems in a variety of tests concerning the impact of altitude on human physiology. For instance, the University of Northern Michigan has used our products to study the physical parameters of performance-related increases in a subject’s lactate threshold. Hypoxico systems are also safe for animal testing, and have been used by the University of Denver to study how altitude affects the breeding patterns of cows. Many private pharmaceutical companies have also used our products to test various implications of altitude upon the physiology of mice. Whatever your altitude study needs are, we can work with your organization to accommodate, streamline, and customize your research with cutting edge technology and our diverse selection of products and services.